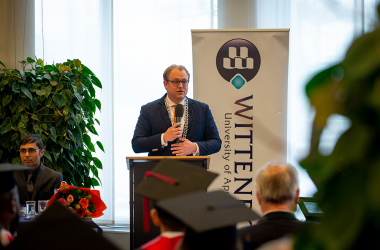 Deputy Mayor of Apeldoorn Urges Graduates to be "Environmental Ambassadors"
The latest group of Bachelor and Master students from Wittenborg University were elated when they received their diplomas at the 2019 Winter Graduation Ceremony on Friday. They were joined by the first group of teachers to receive their Post-Graduate Certificate in Learning and Teaching in Higher Education. Graduates was accompanied by friends and family to celebrate with them. Some flew in specially for the occasion like in the case of IBA student Tianyi Zhou from China who brought along her mother and grandmother for support. 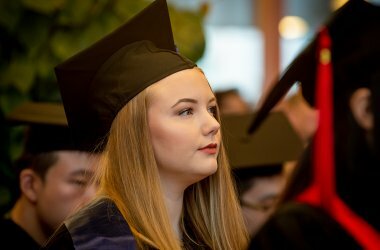 The group of graduates consisted of 9 Master of Science students, 1 MBA student and 19 Bachelor (IBA) students in addition to 5 Foundation Phase students and 4 Exchange students from China who also received diplomas. 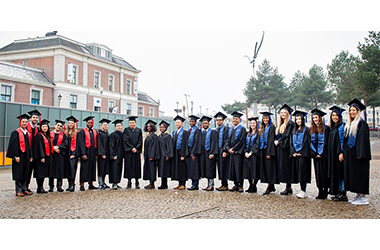 The countries graduates come from are the Netherlands, Cameroon, China, Germany, Iceland, Canada, Kazakhstan, Russia, Sri Lanka, Norway, Bangladesh, Indonesia, Iran, Vietnam, Rwanda, Burundi, Turkey and Nigeria. The keynote speaker at the ceremony was the deputy mayor of Apeldoorn, Mark Sandmann. He congratulated students and urged them to use whatever career path they choose, to make a difference in others people's lives. Quoting former US First Lady, Michelle Obama, Sandmann said: "Success is not about how much money you make, it is about the difference you can make in other people's lives." He also reminded graduates of the urgency of climate change and the difference they can make in that respect. "Wherever you decide to go, I hope you will act as environmental ambassadors. "Billions of people around the world aspire to higher income, but prosperity needS to be accompanied by a reduction in carbon intensity. As you set out in the world to start your career or further your studies – especially if you go into business – let that be your guiding light." He urged students to continue their education in order to keep their "competitive" edge. Tuninga also said one of the skills students learned at a institution as diverse as Wittenborg was to respect diversity and understand people from different cultures and backgrounds better." This sentiment was echoed by many graduates in their feedback about Wittenborg. One of the MSc students from Brazil, Renan Antonio Roma, said after studying at Wittenborg he has a new appreciation for other cultures and diversity. The group of teachers who completed their PGCert programme are lecturers George Bosire (who attained top marks), Gilbert Silvius, Lucy Omwoha, Adeyemi Banjo, Bert Meeuwsen, Fjorentina Muco, Myra Qiu and Dr Rauf Abdul. They were presented by Wittenborg's President & Chair of the Executive Board, Peter Birdsall. Birdsall initiated the PGCert programme in September 2017 in collaboration with the institution's UK academic partner, the University of Brighton. The programme - which is open to external academics from this year - aims to bolster the quality of teaching and improve student experience in the classroom, while providing Continuous Professional Development (CPD) for Wittenborg's academic staff.